Communication Equipment | Products | MURATEC,MURATA MACHINERY, LTD. Faster, broader, and more advanced information transmission capability strengthens the business network. As a pioneer in the facsimile communication market, Muratec has, since 1973, manufactured innovative products that play an integral role in office communication. The increasing reliance on network technology has placed a greater emphasis on effective knowledge management. Regardless of company size, the need to share business-critical data and communication via the network has become increasingly important. 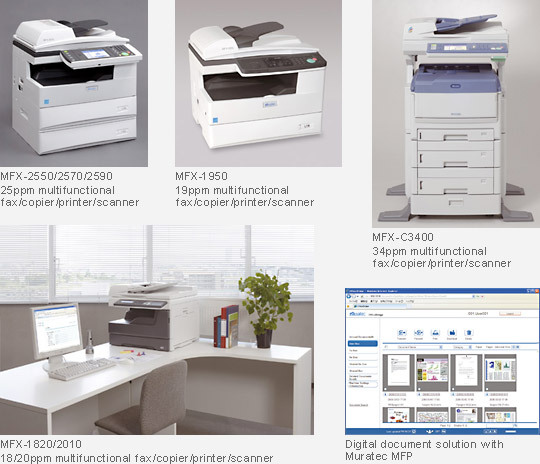 Companies with established intranet and LAN environments are bypassing traditional stand-alone copiers and facsimile devices in favor of network-ready MFP’s (multifunctional peripherals) which combine functions such as copying, printing, scanning and faxing into a single, easy-to-use device. Muratec is at the forefront of this transition by developing powerful, network-ready MFP’s and document imaging solutions that offer customer’s greater value, efficiency and reliability.